You are here: Home / Credit Cards / What’s Good About Sam’s Club Credit Card? What’s Good About Sam’s Club Credit Card? If you wanna take advantage of some of the amazing deals out there, then the best card for you is Sam’s Club credit card. One of the most convenient things is the online banking that is available with a Sams club credit card like Synchrony bank do. Synchrony bank claimed that they are the largest operator of private label credit cards in America based on receivables and purchase volume. It’s great that you can access your account online day or night without ever having to leave your house. This means that you will now be able to pay all of your bills online using the card. You will also be able to keep track of your spending habits and where you are at with your spending. And, should you need it, you can apply for more credit–again, all online. And, in the United States, when people talk about member only exclusive shopping, Sam’s Club comes to mind first. Why is this? Because the Sams club is focused on selling quality products at the lowest possible price, to bring the maximum amount of value to the everyday consumer. The card helps this even further, as by using the credit card, shoppers accumulate points which can be redeemed in store for even deeper discounts on store merchandise. 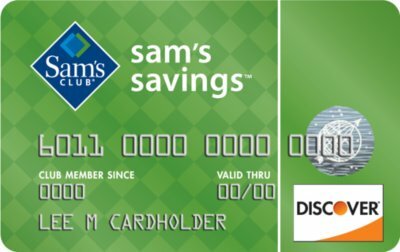 The Sam’s Club credit card is provided through discovery card, and customers get a couple of different options – the personal card option or the business card option. Personal users can qualify to receive up to one percent off their purchases, and business users up to two percent. So it can really add up when you start paying your bills with the card. Especially when you use it for gas – which can be much cheaper than surrounding stations. And another great benefit is that once you get Sam’s credit card, you don’t have to walk around with your membership card as your credit card will then act as your membership card. To make things even easier, it’s super easy to apply for and receive Sam’s club credit card. You should have no problem to get accepted for your application. Just go down to your nearest store and apply. But remember to keep your eye on your spending, as specialty cards like this often come with higher rates of interest. In some cases, you may even be eligible for a cash back option if you get the Discover card option if you spend upwards of ten thousand dollars per year using the card you will get 2 percent cash back, and if you spend less you get less back. I believe the lowest cash back option is around point two five percent cash back. But in terms of a rebate on top of the low prices you are already getting if you do your shopping at Sam’s club, then every little bit helps, as in reality, its an even larger saving. One other nice thing about the card is the zero dollar fraud liability that comes with each of the cards. This means that if you don’t use the card, you aren’t liable for the purchases made on it (as in the case your credit card was stolen and then the thief went on a sudden shopping spree using your card). If you have a question on what can I do with my Sam’s credit card? Well, you can actually use your Sam’s credit cards to do your shopping at any Sam’s Club, or making payment at any Sam’s Club gas stations. This is especially nice if you do any sort of traveling, as it’s very easy to use your card in the wrong place without knowing (for example in a bad area of town with dishonest clerks) or to lose it in the midst of your rushing around. So the next time you are ordering Champaign on the beach, you can rest assured that your card and its purchases are safe. In some cases too, your Sam’s club credit card may also be able to earn you air miles that you can use towards a trip. In this case, you can earn one travel point for every dollar that you spend (regardless of where you spend it!). This is a major difference between the card and their competitors – most of their competitors only offer this type of compensation for purchases made in their store. These travel points can be used for airline flights, hotel accommodations, car rentals, and a few other things. So, not only will you save money by making payment with Sam’s club credit card when you shop at their store, but you could also be earning travel reward points to get a free trip or even cash back! That’s quite a nice little bonus just for using your credit card! It is possible for you to make the payment of your card through Sam’s Online Payment. You may simply register a Personal Credit Account follow below link and you can then make your payment online. Alternatively, the company is now partnered with CheckFree which is an online billing leader that can help in bringing you a Personal Credit bill electronically and you can then pay accordingly. I would like know how long would it take to provide me for the sam club’s credit card if i provide by all how instill all email me so i know.